Marvel vs Capcom’s been out for a while now. For those who play, how’s your game shaping up? Developing those killer combos and strategies? I’m not sore just from the missed opportunities for “cataclysm” references, either. I wanted to see what Nitsuma and his crew would do with Rock’s move set after Roll’s treatment in Tatsunoko vs Capcom. Unfortunately for me that didn’t happen, and it doesn’t seem especially likely now, even with that initial fan outpouring of support for the guy. 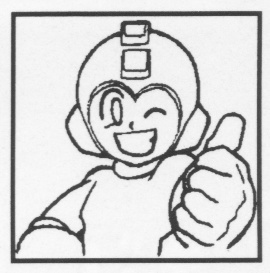 I’d jump at the chance for practically any additional Rockman character, so his presence or absence certainly won’t make or break the game for me, but it would have been interesting. In honor of Rock who didn’t make the cut, here’s some concept art of his original MvC appearance from the Versus Heroes Variable Cross Set, aka the Marvel vs Capcom Secret File. At first, he was going to fire diagonally downward. 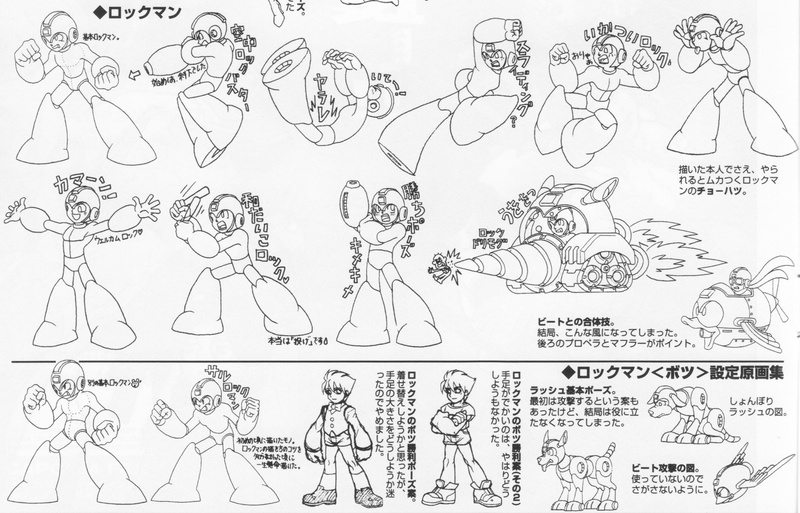 Even the artist drawing this felt wounded by the raw power of Rockman’s sharp-cutting taunt. This is basically what we finally wound up with. The scarf and the propeller in the back are the main features. This was drawn really early on. I didn’t really understand how to draw Rockman yet back then, but I was trying really hard. Rockman’s Unused Victory Pose Idea. We thought it would be fun to give him a clothing change, but we couldn’t quite decide what to do with those oversized arms and legs and gave up. 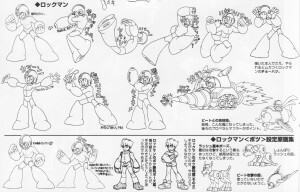 Rockman’s Unused Victory Pose Idea (#2). Once again, we couldn’t figure out how to handle those massive limbs of his. In the beginning we planned on having him perform attacks as well, but in the end he didn’t wind up being all that helpful. We didn’t wind up using this either, so don’t bother searching for it. I don’t think the street clothes Rock looks too bad. Did any of those unused bits ever get added in for the home console editions, or am I just thinking of Roll’s schoolgirl outfit? One of my favorite things I remember about the Playstation version of MvC was that Rock could use Magnetic Shockwave after beating the game. Too bad he didn’t change colors when he did it… Actually, that always bugged me a little that Rock didn’t change colors when he changed weapons. Not that it would be especially practical to implement that in the game, I realize. But so was picking up those weapon switch items from Eddie. But I also loved Rock’s hypers and sliding move and one touch fireball. Crossing up the play control of Rock Vulnutt in TvC and Rockman in MvC, they could have yielded a pretty fun and amazing character. They could’ve always done what I do when drawing armour-less Rock: make his limbs much thinner than those gauntlets and boots would imply. What makes me more upset is that I cannot have a Megaman-themed team, what with the Blue-Bomber’s absence. Seriously, I was really hoping to have Megaman in the game (with a new and improved moveset, of course) but I’m just going to hold out and play Tatsunoko vs. Capcom until something happens. 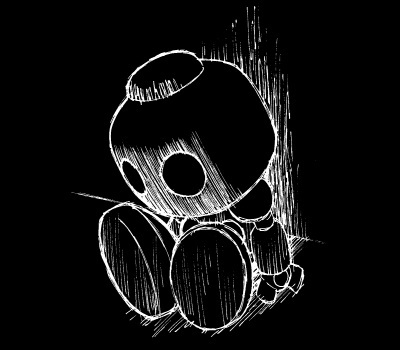 Zero is fine and all, but I’m just burned out with that character. I love Tatsunoko. I really hope they make a sequel keeping with that 2 vs 2 style. For MvC3, as long as they add a third Rockman rep… Hell, even if it’s a Metall, I’ll be happy. Wait–all I have to do to solve my copy’s crippling character-loading issues is to burn a new copy? I’d recommend a quick internet search on the subject before you start burning just to get all the details straight, but yes! Though it’s been quite a few years, I remember it being a pretty painless process. If your game is too seriously scratched to be properly read, you might have to get the image from someplace else. I can say that I’ve never had a problem with getting burned games to play on my unmodified DC.